So I'm away on a business trip for a week. Eating out a lot. But I'm prepared for when I get home because I've made some my own frozen treats to keep me satisfied while I get over jet lag - 30 homemade vegetarian potstickers! That's the key to traveling and a frantic lifestyle - when I have the time, I stock up. This is also a great winter treat. I used the end of my winter storage (cabbage, carrots, parsnips, and even potatoes) along with more traditional stuff from the store. As long as you have some of the key ingredients, you can add whatever else suits your fancy (or happens to be in your make-shift root cellar). 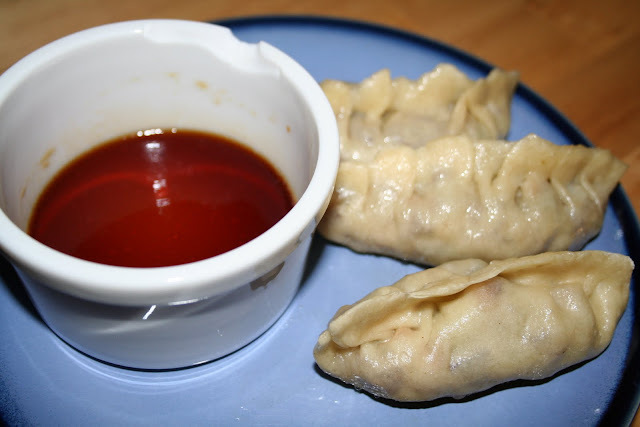 This recipe is adapted from my favorite dumpling recipe with awesome step-by-step, mouth watering pictures. 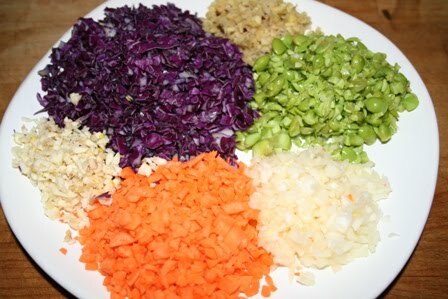 Mince all the veggies you gathered. Don't grate. Don't use the food processor. Well, unless you're really busy/lazy. I put everything in lovely piles for this picture, but don't be afraid to mix it all up. 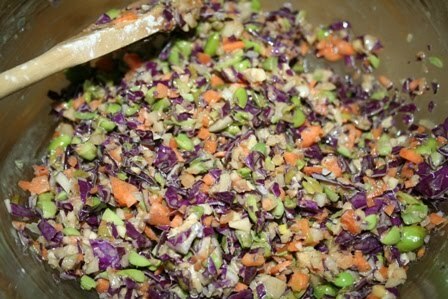 Put all the minced veggies in a large bowl. Add the corn starch, soy sauce and sesame seed oil. Mix well and put aside. Mix the flour and warm water till it starts to form a ball. Turn out onto your work surface and knead for about 20 strokes. Roll into a ball and cover for 15 minutes. Cut the ball into 1 1/2 inch strips. Take one and cover the rest with a kitchen towel. Make a cylinder out of the strip and cut into 3/4 inch pieces. 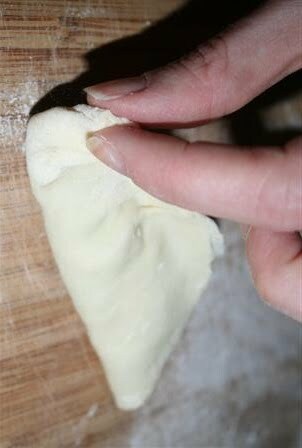 Roll a piece and fill with about a tablespoon of the filling. This is the hard part, the pleating. Don't worry, even if you mess it up, they still turn out looking pretty good. Start by folding in half and pinching the midpoint together, Then start pleating one side toward the middle, about 3 - 4 times. The pleat the other side toward the middle the same amount, making sure all the pleats are on the same side of the dumpling. Squish it all together till you're sure it's sealed. 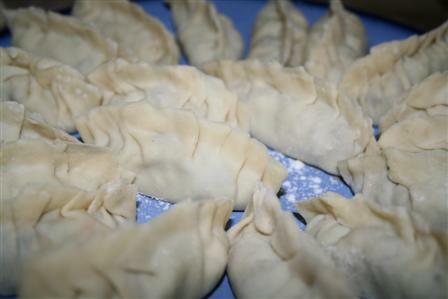 Rub the bottom of the dumpling through flour and place on a floured plate or cookie sheet (whichever will fit in your freezer). 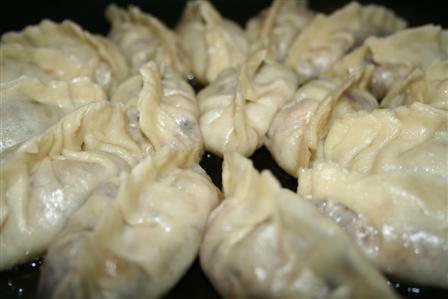 As you fill up the plate/sheet, make sure that the dumplings don't touch. When it's full, put in the freezer for a few hours. When they start to firm up, pull them all off and put into a freezer-safe storage container (I use Ziplock). When you're ready to eat these suckers, heat cooking oil in a nonstick pan over medium-high heat. Layer on the potstickers and cook till the bottoms are brown. Then add about a half cup of water to the pan and quickly cover. Allow to cook for about 15 minutes, making sure that they don't actually stick to the pan. Then allow to cook uncovered until the water evaporates. 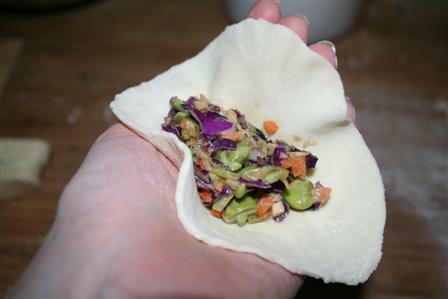 Serve with a mixture of soy sauce, sesame seed oil, and rice vinegar.